You can say that Zari Adrianna Tomaz, the newest person to climb aboard the Waverider in tonight’s DC’s Legends of Tomorrow, is resourceful and bright. When we meet her, she’s living underground in a dystopian Seattle in 2042, keeping herself off ARGUS’s radar through her formidable hacking skills. You can say she’s fast-thinking, managing to deftly evade both the Legends and the water-wielding villain who seems to have targeted her. You can even call her magical—especially after she unlocks a new ability later in the episode. Just don’t call her compliant. While she may be heroic, Zari is all too happy to break rules, lie, cheat and steal if it’s for the greater good. Which makes her perfect for this scrappy team of time-travelers. 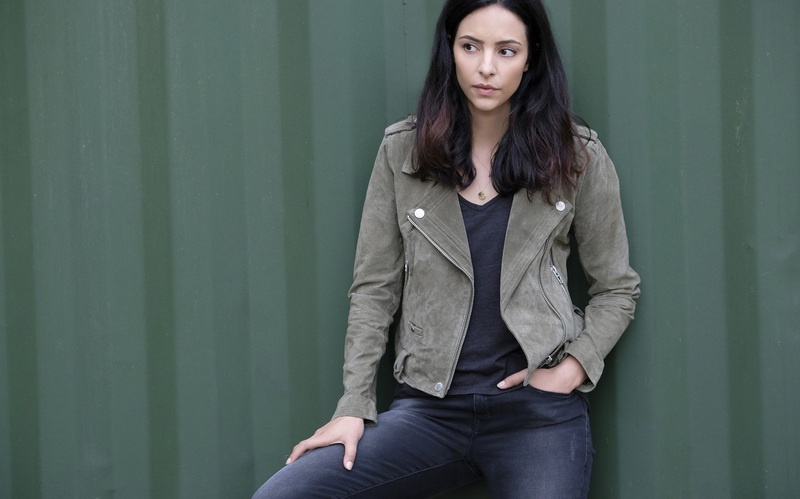 Adrianna Tomaz, of course, is the latest woman to channel the power of the goddess Isis within the DC comic book universe, but don’t look for much of that on Legends of Tomorrow. Zari’s power set is different from her comic book counterpart’s and there’s no ancient Egyptian goddess to be found anywhere. However, there are a few similarities beyond the name. Like Adrianna, she also finds a mystical amulet that bestows her with powers. And it may even bear a clever resemblance to one you’ve seen before. That amulet turns out to be another nature-based totem, much like the one worn by Vixen, who has also recently found herself back aboard the Waverider. In last week’s episode, Amaya was having some trouble controlling her totem, but Tala and Marc promise that the two will share a close connection in the episodes ahead that also taps into the greater Vixen story as a whole. In “Zari,” it’s Mari McCabe’s sister Kuasa who is pursuing Zari in 2042. The Legends have had it rough since they “broke time” during their battle against the Legion of Doom. Along with cleaning up the anachronisms they created, they’ve also had to contend with the newly formed Time Bureau and the absolutely driven Ava Sharpe, who seems to harbor a particular animosity for them. Plus, there are all these whispers of Mallus—whoever or whatever that is. Adding a new crew member is a wild card that may or may not work out, especially since Zari is new to the world of time travel and hasn’t had the same rules hammered out for her that the rest of the crew has. Which isn’t to say that Zari will strictly create conflict, though the producers promise that we can expect a few fireworks with Ray Palmer in the next episode, whose optimism doesn’t exactly synch up with the worldview of someone who’s been living in a dystopia. Behind the scenes, there was a little uncertainty for Ashe as well. Though it was quickly smoothed out by a supportive cast that after two seasons is somewhat used to welcoming new Legends into the fold. She may be the newest member of the cast, but with a totem that seems to tie into this season’s mythology, Zari promises to be at the heart of it all, including an upcoming “bottle episode” in which the time travel hijinks take a backseat to a more thought provoking sci-fi story that the producers compare to classic Star Trek. "Zari" airs tonight on DC's Legends of Tomorrow at 9 p.m. (8 p.m. CST) on The CW.